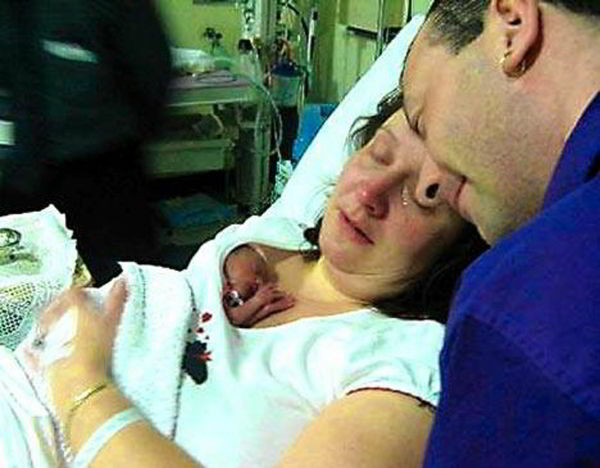 Mothers last skin to skin cuddle saves her 20 oz baby. What can be better than a mother’s touch? Rachael took birth with a weight of 20oz; the doctors gave up on her and told the mother that she had only a few minutes to live. Disheartened, the mother decided to keep the baby cuddled and give her skin to skin care so that she doesn’t die in cold, but feels her mother’s warmth before closing her eyes forever. The little angel’s heart was beating once in every ten seconds and she had stopped breathing. When the doctors gave up, Miss Isbister requested them to put her baby on her chest and not wrapped in a blanket like a doll. She said that the baby’s feet were so cold that she could barely bear the thought of her slipping away and passing on to the other side. The only thing she could do was cuddle her and give her skin to skin contact so that she knows that her mother is there for her. Just when Miss Isbister thought she lost her baby forever, something remarkable happened; she calls it a miracle. The mother’s warmth kick started the heartbeats of the little angel and she started breathing. The most surprising thing was that her heartbeats were completely normal in a few seconds, which was nothing less than a blessing from the divine spirits. The mother said that everybody in the chamber was awestruck because it was one of the most unusual things ever happened there. After checking the heartbeats of the baby, the doctors confirmed that there were hopes for her to survive. The 36 year old mother did not know how to react for she had given all her hopes, along with her 35 year old partner, David Elliott. Currently, their baby is not only alive, but also healthy and strong. Previous articleEach episode of TV reality show ‘The Big Bang Theory’ was filmed in front of the real audience.No laugh track is used. Next articleSlow Time Cafe where people are charged for the time they spend their and not for the things they order.